Bose is taking on Sonos in the music streaming market with its new SoundTouch Wi-Fi system, which will sync up all of the audio brand's future products via an app remote control. Three new Wi-Fi and AirPlay-enabled speakers launch today to spearhead the firm's new focus on connected audio: the 9lb woofer-packing SoundTouch 30 aimed at the living room, the more compact SoundTouch 20 for secondary spaces, and the doubles-as-a-rechargeable-Bluetooth-speaker SoundTouch Portable for on-the-fly and outside access. As well as 18,000 internet radio stations, the system also supports local network MP3 and AAC files (alas no lossless), with a 'presets' system letting you assign playlists, radio stations or even specific songs for one-touch access. 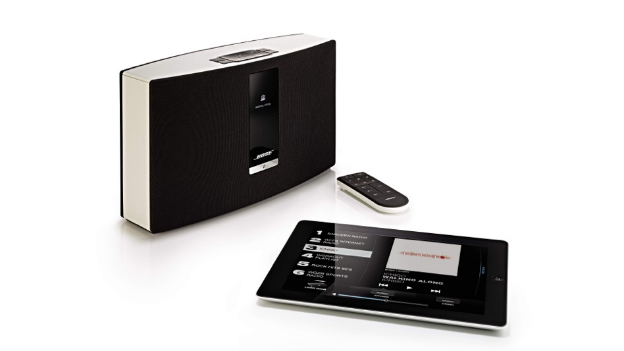 Be it from the SoundTouch app, the included remote control or the buttons atop the speakers. The app that links them all together is available for iOS, Android, Mac OS and Windows devices. And there is also a Nest-resembling circular SoundTouch controller that can sit on your wall and control it app-less, if you so wish. T3 went hands-on at the launch event in New York this week and the interface is smooth and the sound strong. However, there is no integrated Spotify support currently – an AirPlay workaround from the Spotify app will have to suffice until the deal has been signed – while Deezer access and a NAS drive update aren't coming until next year. All new products across Bose's ranges will support the system in future. Older products cannot join in via a system update due to higher power requirements, but a connected amp adaptor is said to be coming next year. The SoundTouch 30 is £600, while the SoundTouch 20 and SoundTouch Portable are each £350, and all are available from today. See the Bose homepage for more information and stay tuned to T3.com for a forthcoming review. Will Now TV win for the second year running? Or will Netflix, Amazon, iTunes, Google, or Mubi steal the title?